A few months ago, I stumbled across an old photo of the Walt Disney World Shopping Village. 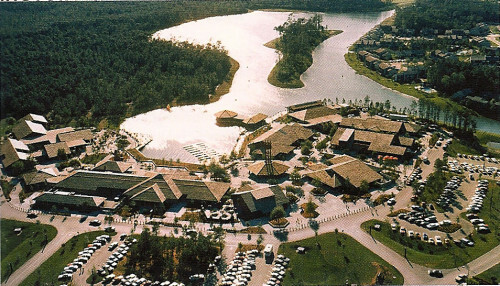 For those of you unfamiliar with the Village, it was a collection of stores and boutiques centered around a quiet lake. It was always sunset at the Village. Every souvenir was a loving, one-of-a-kind work of art. Seagulls would give you head massages and pay you for the privilege. The main merchandise store featured t-shirts individually hand-knitted by Imagineers. Souvenir coffee mugs were sculpted out of leftover attraction props. There were literally thousands of plush animals, from the standard Mickey to the more rare charaters like Monstro and the Crocodile Soccer Player from Bedknobs and Broomsticks. Eventually, the Walt Disney World Shopping Village became the Downtown Disney Marketplace, with its distinct urban flair like plastic sea dragons, princess makeovers for four-year-olds, and a Goofy candy store where you can buy entire tubes of neon pure-grain sugar. The Marketplace is hip and live and full of brand names. The Village was laid back, sleepy, and utterly groovy in its 1970s-ish-ness. Good riddance. Sleepy, check. Sunset, check. Seagulls, check. Anyway, there’s the picture I was talking about. This was taken by one of the aforementioned seagulls, which accounts for the high perspective. Just look at that tiny little burg. The right side is more or less identifiable. That distinctive hexagon building with the tower is still there today. That structure jutting out into the water is Cap’n Jack’s, which only a week or so ago was still standing—it’s almost gone now, folks. Destroyed in the shadow of a volcano. Just like Pompeii! 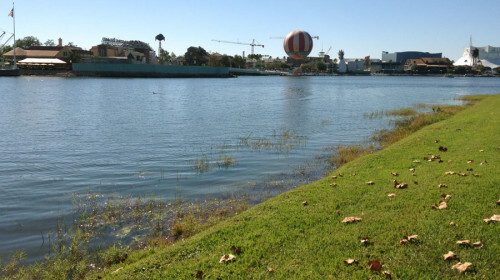 The buildings on the far left side are basically where World of Disney stands today. And then… nothingness. Just acres of Florida scrub pine. Total wilderness. Even the Empress Lily, that queen of WDW 70s Nightlife, is but an empty beach. And forget Pleasure Island, which wouldn’t come along for another decade or so. And how about that parking lot? What is all that green stuff? It must be mold growing on the vast ocean of asphalt that stands there today. I think the number of cars is fewer than the number of dollars it costs to eat lunch at Rainforest Café, or the number of parasites my son gets playing in those squirting water fountains. In the upper right quadrant we have a cluster of bungalows that look completely unfamiliar today. Saratoga Springs sits in that same area, but none of the buildings seem to match up. The Disney Institute—Eisner’s summer camp for adults dream child—must be responsible for the vast alteration of the landscape. You can just make out a channel near the top winding back through the golf course area. 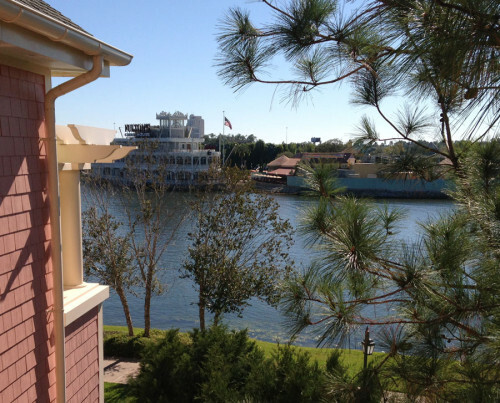 It looks to be essentially the same channel today, which ferries people to Port Orleans. And then there’s the island. It’s not a thriving island civilization. In fact, it looks completely devoid of development. There’s not even a boat dock. It’s just a random patch of land in the middle of the lake, covered in more Florida foliage. Home to many exotic beasts, I’m sure. It’s a good size. The perspective on the picture is distorted, but that thing looks at least as long as Pleasure Island. Let’s take a look at how that island appears today. Yep. The entire island has up and vanished. Whole mythologies have sprung up around lesser disappearances. Something has wiped the island from the face of the earth. Centuries from now, future parkeologists will no doubt discover a Map Room buried in the basement of Once Upon A Toy, pointing to hidden treasures on this island. But until that time, we have only our imaginations. No doubt it disappeared either during the Pleasure Island construction, or possibly the reshaping of the shoreline for the Disney Institute. Must have been quite a feat. It’s too far out in the middle of the lake to have been absorbed by the Institute, as the google map clearly shows. That means they not only were resculpting from land, but somehow they had to bulldoze an island in the middle of the freaking lake! 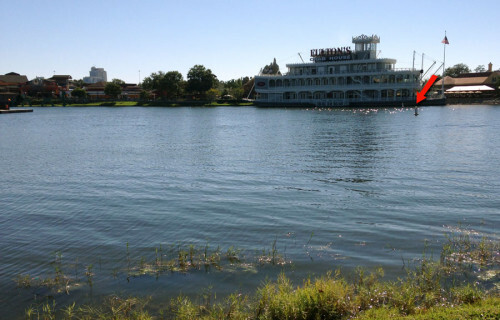 We’ve seen Disney backfill into water in recent years (Bay Lake Tower, Villas at Grand Floridian). 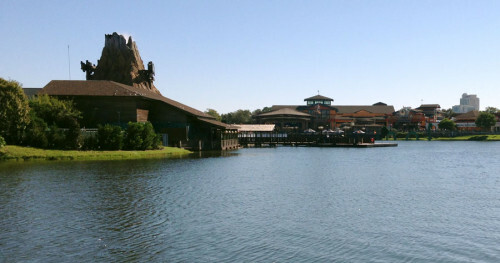 Some of the islands in the Seven Seas Lagoon were man made, in the process of Disney creating that lake. And things like Discovery Island were original islands before Disney got their hands on the property. I’ve never heard of them actually obliterating an island before. I don’t even know how they would do it. A bulldozer on a barge? Not a great shot, so I helpfully added a bad photoshop arrow. It seems to be roughly at the same spot as the tip of Eastern tip of the island. There’s another buoy further West, which approximates the other end of the island. The romantic in me likes to think these buoys are there to mark shallow water from the lost city of Atlantis lurking beneath the surface. But the real explanation is probably more mundane—just wake control for the marina boats and the various ferries. The Western Buoy. No arrow this time. I want you to work for it. On the bright side, I did find Saratoga Springs to be rather inspirational in a spooky sort of way, and plan to write more about that in the future. But when it comes to the sunken island, I’m afraid my trail has dead-ended. Those of you who are SCUBA-certified… you know what to do. My attempt to survey the area from the heights of Saratoga Springs was thwarted by a tree. This entry was posted in Lost and Abandoned Disney Details and tagged Disney Institute, Downtown Disney, Empress Lily, Saratoga Springs, Walt Disney World Shopping Village. Bookmark the permalink. I would imagine that they simply dredged it up and used the soil for building Pleasure Island.Rather, “slid the island over” so to speak. Famed naturist, John Muir, would not be happy with the destruction of that island. It was bully beautiful! How did they make the island disappear? I’d bet that they dredged around the base of the island and then as the trees started to slide into the water they could have grabbed the trees and lifted them into a barge. as for why? Probably they needed to “fill” part of a body of water elsewhere on property so they had to “make” a volume of water to compensate here. 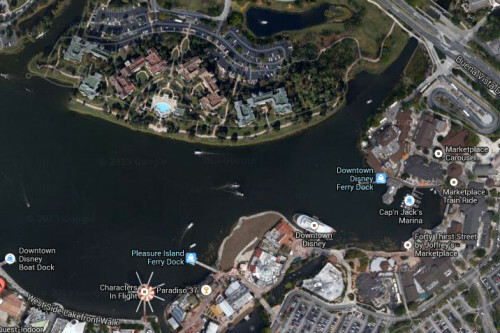 There was a similar “trade” when they built the Grand floridian DVC recently, if i recall what I read correctly a cove on bay lake was made larger in order to make up for fill of the Seven Seas Lagoon for the DVC property. Thanks Neon. We love that you love us!